The National Travel Safety Board have recommended a ban on all drivers from using electronic devices while driving. It’s about damn time. The proposed ban would extend to cell phones, even hands free devices like Bluetooth ear pieces, but would allow for drivers to use cell phones in an emergency, and GPS navigational devices. While the recommendations are far from binding, and it’s unlikely Congress will take any action that gives the appearance of “Big Government” meddling in personal lives, it should at least influence the decisions of legislative bodies. Hersman also indicated that the catalyst for the recommendation was a tragic accident in Missouri that killed two people and injured some 38 more. The pile up was blamed on a 19 year old driver who sent or received 11 text messages in the 11 minutes leading up to the enormous mess of collisions. Well said. In 2010 alone, distracted driving killed more than 3,000 people. This is the kind of thing that is completely preventable, and it’s encouraging to see signs that research might drive policy decisions on this issue. However, there’s serious pushback on the idea that it’s absolutely necessary to be fully focused while driving. A study in Wayne State questioned the efficacy of previous studies that touted the dangers of distracted driving. 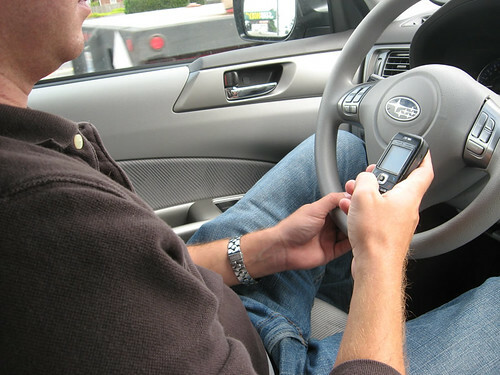 However other studies, like one out of the Texas Tech Institute have shown that drivers using phones, especially to text, are incredibly dangerous on the road. Despite mounting evidence that using a phone while driving is dangerous, only 10 states currently have hand-held phone bans. Texting presents a more self-evident danger, and 35 states have correspondingly adopted texting while driving bans. The big news here isn’t that people are acknowledging how dangerous phones can be in the car—I think we all get that part. What’s great for road safety advocates is that this is also banning hands free devices. There’s long been a myth that using hands free phones is safe. But when you’re on the phone, your mind is still distracted, even if your hands aren’t. Advocacy group Focus Driven writes that, “studies show hands-free devices provide no benefit.” With carmakers doing more and more to integrate distracting technologies in cars, it’s important to acknowledge that hands-free is not the same as distraction free. Here’s hoping that the recommendation can help push through bills that propose tying Federal funding to states that accept distracted driving laws.